"It's been an incredible journey thus far. In preparing for rehearsals for Machu Picchu earlier this year, Sue Smith and I met people who gave us amazing insights into life as a quadriplegic. When we workshopped the script in 2015, I had tried remaining immobile throughout the final reading of the play. By the end, it felt like a very superficial choice – like I was just being still for the sake of it. 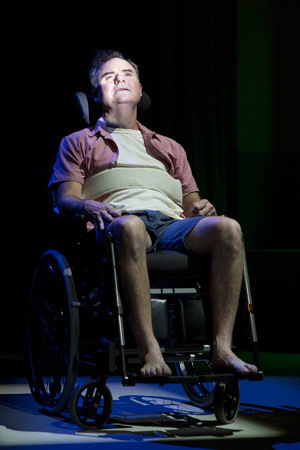 But, when I met these people with quadriplegia, I noticed their breathing was quite shallow. And after a bit of research, I understood that a quadriplegic only has 1/7th of the lung capacity that you or I might have, because the intercostal muscles and the diaphragm aren't working as they might. So, most of the breathing is in their upper chest and quite short – it's not fuelled by long breaths. Now, as actors, we always work to punctuation and we pride ourselves on having big voices and big breath capacity. So, this different kind of breath seemed like the most inside-out way for me to approach the role. When we started rehearsals, the first passes at scenes are always about making sense of the text. You can only really do that through the punctuation that the playwright has given you. So, for the first couple of weeks, it was about working with the script as it was on the page. Then, it was about adding two layering processes: one was the physicality and one was the breath. To see everything through the prism of breathing created a natural tension. If you've got a monologue where you want to have a go at someone, then the idea of not being able to fuel those feelings as they're coming to you and having to add these intakes of breath just adds this great natural tension, which I found exciting to work with. And then, when I play Paul in the earlier timeframe, before the crash, it's the full body and the full voice, so you can see a real difference. The other thing was the physicality. In the 6 months after the crash that the play covers, Paul gradually gets movement back in his shoulders and forearms, but not the fingers. So, I was charting that over the 6 months and anatomically understanding which muscles switch on and which don't. Hamlet's line 'suit the word to the action, the action to the word' – that's so natural for us actors – when we talk we let sounds zing to our fingers and our toes. My career has involved a lot of physical theatre, so to switch yourself off in certain sections, it's a really fascinating process. Being immobile, I've discovered that the real movement is in the words. That's where the movement of the piece comes from. And, for me, the discoveries are ongoing."